This movie is about the Polish "Solidarity" movement - a labor movement that the Communist state considered to be a domestic threat. This movie accurately shows the central government thugs monitoring, arresting and even killing citizens for the simple act of dissent. This didn't take place in the 1910s or 1940s but as recently as the early 1980s! Its worth pointing out that Solidarity wasn't exclusively a Catholic phenomenon and that it was more like a coalition of non-communist peoples. This movie is based on a real priest named Jerzy Popieluszko who aligned himself with Solidarity against the wishes of his superiors. Poland was in a state of martial law and it was an extremely risky time to criticize the government. Now on to the movie. The direction is beautiful but the writing drags at parts. However what holds the movie back is the casting. A lot of times this is a problem when making a movie for an American audience about a European setting (for example, some characters in this movie have accents, others don't). Actors Tim Roth and Ed Harris gave great performances but seem a little out of place. 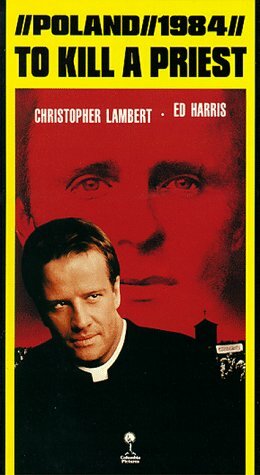 Christopher Lambert of "HIGHLANDER" fame plays the priest somewhat comfortably but only a limited range of emotion is shown with his character. Nevertheless many of the details of the movie are important and included in the dialogue. The movie did not need to be as long as it was, but one interesting thing it shows is how living in a "surveillance state" affects the families of government operatives. You can see a wife who fears that her husband will be murdered because she believes propaganda that Solidarity is a terrorist group. You also see a lonely son who is untrusted by his peers because his father works against religion. Finally, this movie is worth seeing as it details the last gasp of a Soviet satellite struggling to crush public opposition. Polish director Agnieszka Holland is perhaps best known in the US for her movie adaptation of the book 'THE SECRET GARDEN'. Ed Harris plays an up-and-coming secret policeman in mid 1980ys Poland in this morality film about the communist crackdown on the Solidarity movement. The film also gives us Christopher Lambert as a soft-spoken Priest who outdoes his superiors in antagonizing the communists. Supposedly based upon a true story, yPriesty seems to pit Harrisys secret policeman against Lambertys noble and fearless priest during the period of martial law, but the story soon focuses on Harrisys character and makes him the battleground for war of Polandys soul. As Stefan, Harris gamely goes after Lambertys Alec. Though prodded by his superiors y especially Joss Ackland as a morally dubious police chief who tries to get Stefan to murder the priest without having to order him to do it y Stefan finds his efforts undercut by spineless toadies unwilling to openly confront the opposition. Though repeatedly arresting and releasing the priest, Stefanys communist chiefs keep the pressure on both of them, tearing Stefan apart. Stefan, we learn, is the proud lineage of unregenerate Stalinists. Though the nominal chiefs of Poland, the shared popularity of the Solidarity movement and the Church isolates Stefan and his circle, further driving Stefan to the edge. Wanted to like it,but couldn't. Ed Harris plays an up-and-coming secret policeman in mid 1980?s Poland in this morality film about the communist crackdown on the Solidarity movement. The film also gives us Christopher Lambert as a soft-spoken Priest who outdoes his superiors in antagonizing the communists. Supposedly based upon a true story, ?Priest? seems to pit Harris?s secret policeman against Lambert?s noble and fearless priest during the period of martial law, but the story soon focuses on Harris?s character and makes him the battleground for war of Poland?s soul. As Stefan, Harris gamely goes after Lambert?s Alec. Though prodded by his superiors ? especially Joss Ackland as a morally dubious police chief who tries to get Stefan to murder the priest without having to order him to do it ? Stefan finds his efforts undercut by spineless toadies unwilling to openly confront the opposition. Though repeatedly arresting and releasing the priest, Stefan?s communist chiefs keep the pressure on both of them, tearing Stefan apart. Stefan, we learn, is the proud lineage of unregenerate Stalinists. Though the nominal chiefs of Poland, the shared popularity of the Solidarity movement and the Church isolates Stefan and his circle, further driving Stefan to the edge. Excellent performances abound. Christopher Lambert in one of his early acting (rather than more recent "movie star") roles. Joss Ackland is his stalwart, dependable best. But it's Ed Harris's flick, one for the portfolio, at a time when he was still (largely) flying under everyone's radar. This reviewer's introduction to Tim Roth and Pete Postlethwaite, as well. Memorable stuff.